Voyage of the Damned, the third annual Doctor Who Christmas special, was a tremendous success. It was the most viewed episode of the revived series with 13.8 million viewers (and an unknown number of us in the US downloading copies with bit torrent). It is estimated that 55% of British televisions sets were tuned to the special–which must correlate with all those tales of empty cathedrals in Europe. (Warning, spoilers below). The Doctor: Titanic. Who thought of the name? Host: Information: it was chosen as the most famous vessel of the planet Earth. The Doctor: Did they tell you why it was famous? I am Mr. Copper, the ship’s historian, and I shall be taking you to Old London Town in the country of UK, ruled over by Good King Wenceslas. Now, human beings worshiped the great god Santa, a creature with fearsome claws, and his wife Mary and every Christmas Eve, the people of UK go to war with the country of Turkey. They then eat the turkey people for Christmas dinner, like savages. Rickston: Hang on a minute! Who put you in charge? And who the hell are you, anyway? The Doctor: I’m the Doctor. I’m a Time Lord. I’m from the planet Gallifrey in the constellation of Kasterborous. I’m 903 years old and I’m the man who’s going to save your lives and all six billion people on the planet below. You got a problem with that? The Doctor: In that case, allons-y! Mr. Copper: You know, between you and me, I don’t think this snow is real. I think it’s the ballast from the Titanic salvage entering the atmosphere. The Doctor: Yeah, one of these days, it might snow for real. Mr. Cooper wound up remaining on Earth. It seems that his degree as a historian wasn’t very legitimate, and if discovered during the investigation of the destruction of the Titanic he faced ten years in prison. Fortunately the credit card he had for “petty cash” had one million pounds on it, allowing him to lead a good life on Earth, with the possibility of running into The Doctor again. 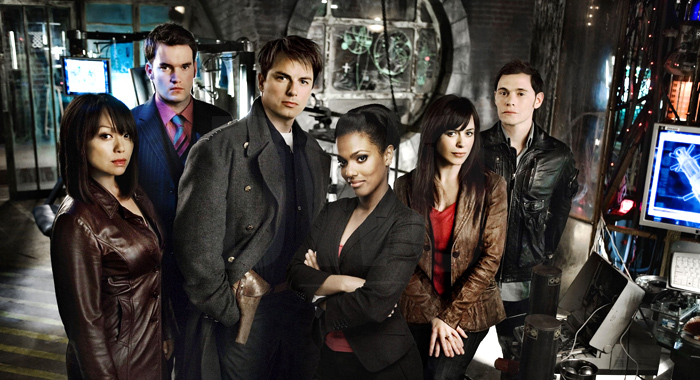 We have to wait until spring to see more of Doctor Who, but its spin off, Torchwood, returns in January on both the BBC and BBC America. Freema Agyeman.com has two videos of trailers for the second season here and here. 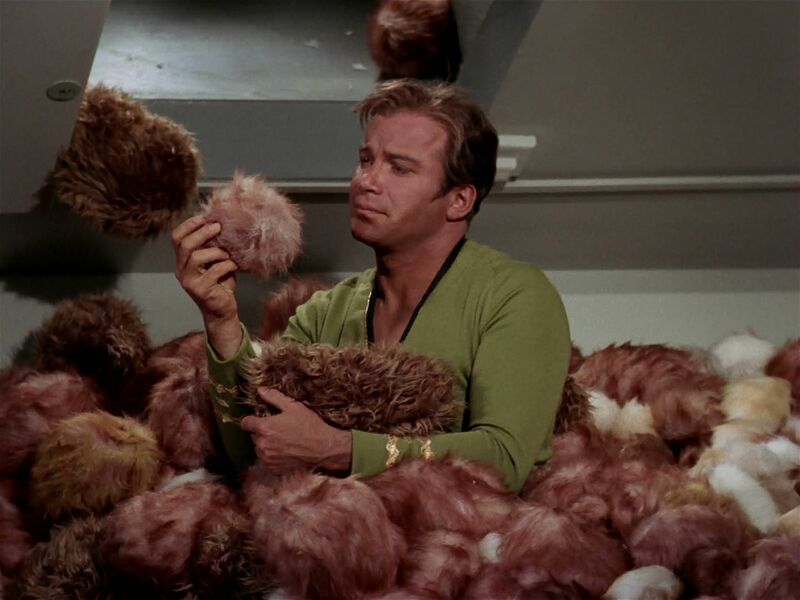 The Trek Movie Report has learned that there will be tribbles appearing in Star Trek 11. They better make sure that all the quadrotriticale is secure. Incidentally, tomorrow marks the 40th anniversary of the first showing of The Trouble with Tribbles. David Letterman’s company has made a deal with the Writer’s Guild. Both his show and Craig Ferguson’s show will be returning with writers in January. The other returning talk shows will be at a disadvantage because of both not having their writers and as many potential guests might be unwilling to cross the picket lines. Peggy Noonan reviews the candidates from both parties based upon whether she finds the candidates “reasonable” as opposed to whether they share her ideology. As a result of looking beyond ideology, I must say that Noonan does a far more reasonable job of assessing the candidates than I would expect from a conservative columnist at The Wall Street Journal. She is also far more reasonable than some of the liberal bloggers who are distorting what she wrote. He has earned the attention of the country with a classy campaign, with a disciplined and dignified staff, and with passionate supporters such as JFK hand Ted Sorensen, who has told me he sees in Obama’s mind and temperament the kind of gifts Kennedy displayed during the Cuban missile crisis. Mr. Obama is thoughtful, and it would be a pleasure to have a president who is highly literate and a writer of books. Is he experienced enough? No. He’s not old enough either. Men in their 40s love drama too much. Young politicians on fire over this issue or that tend to see politics as a stage on which they can act out their greatness. And we don’t need more theatrics, more comedies or tragedies. But Mr. Obama doesn’t seem on fire. He seems like a calm liberal with a certain moderating ambivalence. The great plus of his candidacy: More than anyone else he turns the page. If he rises he is something new in history, good or bad, and a new era begins. But this is not, actually, my central problem with her candidacy. My central problem is that the next American president will very likely face another big bad thing, a terrible day, or days, and in that time it will be crucial–crucial–that our nation be led by a man or woman who can be, at least for the moment and at least in general, trusted. Mrs. Clinton is the most dramatically polarizing, the most instinctively distrusted, political figure of my lifetime. Yes, I include Nixon. Would she be able to speak the nation through the trauma? I do not think so. And if I am right, that simple fact would do as much damage to America as the terrible thing itself. Unfortuantely Noonan couldn’t resist one trivial shot in writing, “Also we can’t have a president who spent two minutes on YouTube staring in a mirror and poofing his hair. Really, we just can’t.” This line, which does weaken the column, has been taken out of context by some bloggers suggesting that this one throw away line is characteristic of her entire column. James Joyner also notes that Glenn Greenwald is inaccurate in his criticism. The YouTube video is hardly the major reason why Edwards should not be president, and is not Noonan’s major objection. While out of place in a column of this nature, the video shouldn’t be totally ignored either. The video actually does capture the shallowness of John Edwards, which is the real issue as opposed to Edwards not being a “real man.” Sure it is possible that any candidate might look foolish if videotaped while combing their hair, but it is no coincidence that such a video has come to represent John Edwards specifically. On the Republican side, Noonan considers John McCain, Mitt Romney, Duncan Hunter, and Fred Thompson to be reasonable. My view of Romney as reasonable has declined the more I see him campaign. While both Edwards and Romney have changed their views out of political expediency, and both appear “insincere” to me, Noonan is far more forgiving of Romney. She also considers Rudy Giuliani to be reasonable. While I disagree I’ll give her a pass on that one as she also writes, “He is reasonable but not desirable. If he wins somewhere, I’ll explain.” As long as she realizes that Giuliani is not desirable it is possible we agree on him. Noonan doesn’t elaborate as to why she doesn’t consider Huckabee to be unreasonable in this column, but did express her views of him in a column I discussed a couple of weeks ago. Huckabee is also notable for being one of only two candidates left in the race who are foolish enough to admit they don’t believe in evolution. The other, Ron Paul, is not mentioned but few would expect Paul to be considered in any review of candidates based upon being reasonable, with some of the reasons noted in a post yesterday following his discussion of a possible third party candidacy. Not surprisingly, she also left out Alan Keyes, and on the Democratic side she left out Kucinich and Gravel.